Small businesses have a lot to benefit from SEO. It is not an exaggeration to say that businesses that don’t practice SEO are in far worse situation than companies who invest in search engine marketing. SEO offers a number of advantages to small business owners and this is what we will discuss in this article. If you don’t know what is SEO, I suggest you first read what is search engine optimization and why it is important to understand the basic terminology behind SEO and its importance in general. For starters, SEO will help you create a better, faster and friendlier website for users. Despite the name, search engine optimization is not only about search engines but the focus is on the user. When your users are happy, search engines are happy as well. Following good on-page SEO techniques improves the user experience and this creates a number of short term and long term benefits. If you think about it, one of the main reasons you have a website is to increase and differentiate your customer base. The web is definitely one of fastest growing markets in World economy but it is not the only one. A successful SEO strategy will help you find new markets and explore new economies. Social media platforms and mobile marketplaces can take your traffic levels to a whole new stage by boosting your SEO performance. An SEO optimized website is fast, easy to use and compatible with mobile and tablet devices. This also translates to better conversions i.e. visitors coming to your website are more likely to become customers, subscribers or loyal visitors. 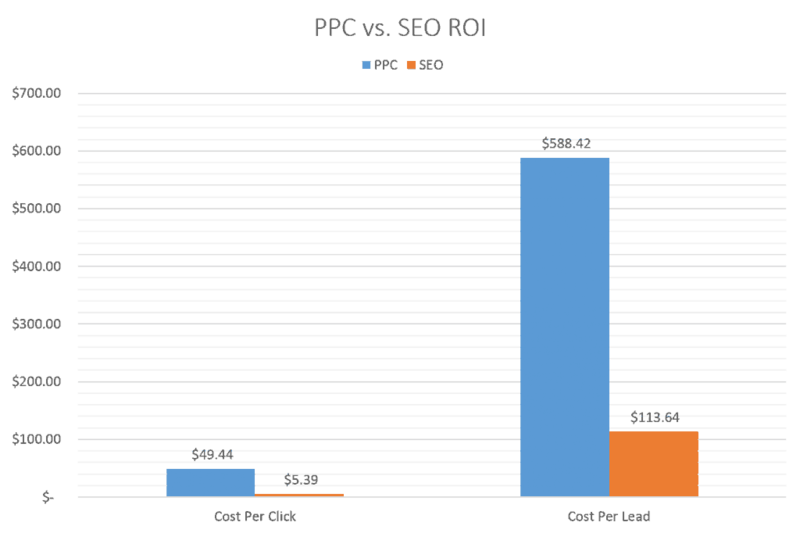 It is not a surprise that the ROI from SEO is lower than PPC or any other digital marketing channel. One of the hidden advantages of ranking in the top positions of the SERPs is brand awareness. Pro Tip: If you are a small business owner follow the instructions in our Small Business SEO Guide to boost your organic presence. This is not the 90’s anymore and search engines play a very important role in building or destroying a brand. A good SEO approach means more traffic and a great way to build a dedicated fan base through email marketing. Email marketing existed before social media and it is still a very important source of traffic and revenue. In fact, many successful bloggers claim that most of their money comes from their email lists and not from social media or other medium. While working on your SEO, make it easy for users to subscribe to your newsletter. It’s a great way to maximize the return from your SEO investment. Search engine marketing is one of the fastest changing industries in the World. SEO Rules and practices change all the time and if you want to maintain your SEO rankings and traffic, you need to stay in-synch with the latest developments. First: Follow the changes made in the SEO industry and make the necessary changes to your website to adhere with the latest standards. You don’t have to be an SEO expert but you need to be informed and willing to take action. Second: Hire a reliable SEO company Part of their job is to advice you on the latest developments so you won’t miss any opportunities. Imagine two businesses in the same niche, selling similar products at similar prices. One of them has a search engine optimized website and the other one has a non-optimized web presence. Other things being equal, which company do you think is more successful? Which company will gain more customers from local SEO and which company is likely to grow faster? Do not underestimate the power of search engines and SEO and don’t forget that if your competitors are doing SEO and social media marketing then you have to do it as well. If on the other hand they are not doing any of this stuff, then it’s your chance to differentiate and make a step ahead. Invest time and money to get your website on top of the SERPs and gain new customers while your business is closed! A webpage with high rankings will also gain more social media exposure. The relationship between SEO and social media is by-directional. In simple words, searches are more likely to LIKE a page when it is found in the first positions of the search engine results than a page that does not have good rankings. How can you take advantage of the SEO benefits? First of all you need a website. This may sound weird but it is a fact that more than 50% of American businesses do not yet have a website. This is a figure from a recent Google survey which also states that businesses that use the web are expected to grow 40% faster than those who don’t. So as a first step you need to register a domain name and develop a website for your business. The minimum information you should provide on your website are: contact details, your company details, products, business hours etc. Second, you need someone to design your digital marketing campaign. That someone is either an SEO with enough experience to go beyond SEO or a digital marketing manager. You need to consider money spend on SEO as an investment and not a cost. If outsourcing SEO is out of the question, then no problem you can do it yourself and still benefit from the advantages. The following articles can help you get started but you should always have in mind that SEO is not about building links (as some people may tell you) but it’s about building a remarkable user experience and providing for top quality content. SEO is not only important for businesses that compete online but it is a necessary investment for all companies. Having an optimized website is the absolute minimum these days. Any money spend on SEO should not be considered a cost but an investment. SEO definitely has a major role in the online success of a business. It is cost effective than any other method of ad campaign. SEO for small business can be a hard nut to crack. Small budgets and limited resources, what I loved about this is you have given people help on how to outsource SEO. I think that’s great. Typically small business don’t have the experts in house who either have the knowledge or the time to learn enough for some local listings. Well tied together, thanks for the post. Great tips and a good overview of SEO for SMB’s! I agree “SEO will help you create a better, faster and friendlier website for users.” Most people and businesses don’t approach SEO properly and today content marketing plays a big roll in the Google algorithm. While SEO seems to have a bad taste for some, it’s still the most cost effective way of getting targetted traffic to your site. That is if it’s done properly. All too often, black hat’s and other make a bad name for SEO. I agree with you 100%. Small businesses have so many benefits to gain from SEO but still the majority of them are missing out. Google algorithmic changes are in the right direction and I believe that the situation is getting better. SEO is a highly measurable marketing activity as their are tools that can tell you exactly how much traffic/conversions you are getting, what position you rank on search engines and how many conversions you are achieving in form of clicks you are getting. That explains why 40% of all business websites have undergone optimization in one way or another. As the optimized websites work for you, you get more time to focus on improving quality and running the business. Thats true, SEO is about improving quality and websites that do this, are in far more better position that websites that ignore SEO. Very nice post!!! I am totally agree with your conclusion that SEO is very important for all businesses. Nowadays, SEO plays a crucial role to maintain your website visibility in SERP. This is so useful post thanks for this, i am 100% agreed on one of your “SEO will help you gain better rankings in search engine result pages” , and better ranking in search engine means more and more visitors will visit your blog. Thanks for sharing informative blog and I appreciate you that you are sharing interesting tips that how SEO is useful for small business. Thank you as well. Good luck with your Small Business SEO Efforts. Mainly SEO is about to get more website brand value and organic traffic directly from search engines with rankings. It is also useful for Online Reputation Management for any business. Online reputation matters a lot and SEO can definitely help you improve that as well. Thanks for this insightful article on SEO. I think SEO is also cost effective compared to other forms of online marketing and it has good ROI. I agree with you, SEO in the long term is a very cost effective method. I never realized how important your internet presence could be to the success of your business. You mentioned that having your site on top of the SERPs can not only gain new customers but will also help with your social media presence. Do you think that SEO is something that a business can be successful with on their own, or do you think it is better to hire an SEO company to handle this side of the spectrum for you? For best results you can do both. You can learn the basics of SEO so that you know how it works and what to expect. Then as your website and business grows, you can hire professionals to work on your SEO and concentrate on how to best run your business. In your article, you stated that SEO will help you gain better rankings in search engine result pages and this translates to more targeted visits and essentially to more customers. I can imagine that if your business has a website then being more visible online could be very helpful. I wonder if there are specific types of SEO tasks that might be more valuable for certain types of companies. That’s interesting that SEO increases conversion rates. I guess if you have a clean running site people will be more likely to trust your business. Search engines like the same kinds of things that people do, so if people are staying on a site longer it will rank better. You mentioned that SEO is a great way for a company to get ahead of their direct competition, as improving online presence exposes you to new customers. I had heard in the past that many businesses were working with SEO services, and I was wondering why. With how often people use the internet to look up everything in their lives, it makes sense that a business would want to make sure they had their presence known there. That’s true, SEO is important because it can help you achieve higher rankings which means more traffic and more customers from Search Engines. It’s the way to build a long lasting business these days. It’s good to know that SEO and social media work together in your marketing campaign. I can imagine how beneficial SEO is for social media as well since you can actually get it out there because your website is more optimized. I wonder if most marketing companies offer both social media and SEO together. It would make sense too, since they can be optimized together by a professional. We do offer SEO and social media together and I’m sure that other agencies have similar services. At the end of the day it comes down to budget and priorities and SEO has a higher ROI than social media. The best approach of course is to do both. Thank you for the handy post. It provides some informative points as to why SEO is useful for small businesses. Thank you for all this great information about SEO! One thing that I never knew is that it can actually help you find new customers and help your website grow twice as fast! It would be nice to know that you will be able to get the best for your business. There really are a lot of benefits to getting SEO work done for your website and I love that the article goes into so much detail on some of them. However, I think the one that most people will pay attention to is how it can help you bypass your competition. After all, if you show up more often in Google searches then you’re competitor then you are likely going to get more business then them. This is just the information I was looking for. Because of spam battles and the extra work comment regulation caused, I had turned comments off of three of my niche blogs. Now I realize that was a big mistake – after several months, I noticed less traffic and saw a direct correlation to ranking lower on Google than I once did for these blogs. I never made the connection to the comments, but now it’s obvious. Thanks for the information – I’m turning my comments back on right away! SEO sounds like it’s great for businesses. I like how you said that it helps with getting more customers, since more people will actually see your website. If I owned a business, I’d put a lot of effort into the website and SEO, I think. Glad you I could help you understand the benefits of SEO.